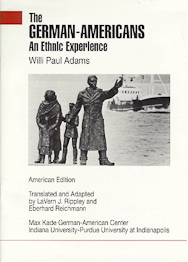 This essay, by Willi Paul Adams, is translated from German as an example of one German immigrant’s experience in the United States and the effort to keep cultural values in an ethnically diverse melting pot (or patchwork quilt). This American edition was translated and adapted by LaVern J. Rippley and Eberhard Reichmann and is a publication of the Max Kade German-American Center. The cover photo commemorates more than three hundred years of German immigration to North America. The bronze statue, entitled “Parents with Two Children,” stands at the harbor of Bremerhaven, a port city in Germany. Its creation was funded by German Americans.